Now that major construction is complete, time for fine details, starting with flattening the top. 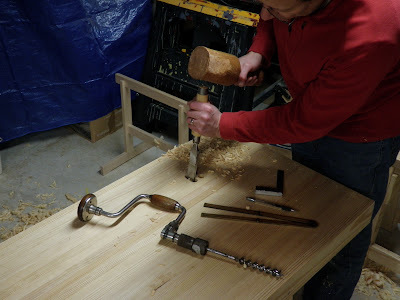 But first, I had to take care of some maintenance resulting from earlier rough-planing. When I planed down the leg glue-ups, I took off some good size chunks of fully-cured glue drips and squeeze-out. Those chunks bit back, taking sizable nicks out of the freshly crowned iron in my transitional plane. Here's the nicked iron. That'll take some work on the 80-grit sandpaper to remove. 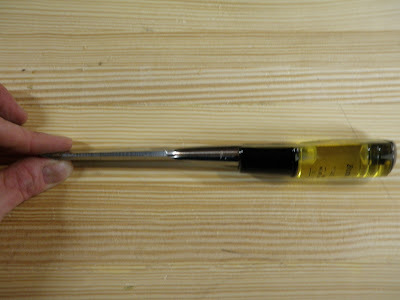 Which reminded me, I had modified a cheap plastic-handled chisel some time ago specifically for glue removal. I don't care how much this gets beaten up. I hacksawed down the length of the handle to make it lie flat across a surface and rounded the corners to prevent gouging. 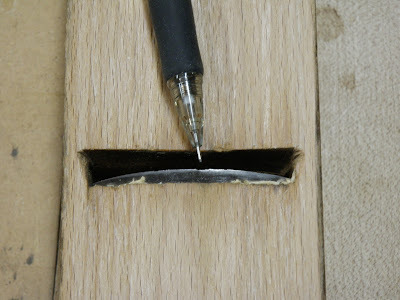 Removing the dried glue from the top with the chisel. These are the seams from gluing up the six sub-assemblies. After restoring the blade in my transitional jack, I rough-planed the top. I started by chamfering the front and back edges to prevent spelching, then took a couple passes traversing directly across the grain. 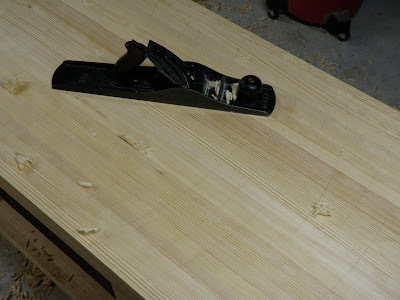 I switched to several passes of diagonals, first from one side, then the other, then changed to the jointer. 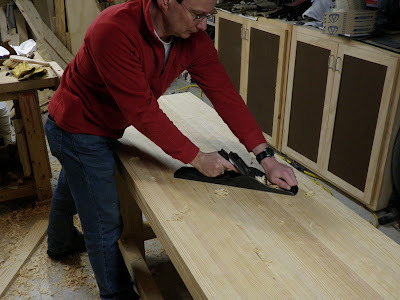 Making a diagonal pass from one side with the jointer. I made a series of pencil lines back and forth across the top prior to jointing down the length. They're just visible here. I made several overlapping passes down the length of the top, eyeballing the flatness and checking for wind with aluminum angle-iron winding sticks. When the pencil lines were gone, I was done. Finally, I made one pass with the smoother. Total time: about an hour. Could I have gotten it flatter? Probably, but this was my first time ever doing this, so I figured it's best to quit before over-working it. If I find it's not good enough, I can take more passes. Now for the planing stop. This is a 12"-long 2"x2" block that slides in a friction-fit through-mortise in the benchtop. Tap it from below to raise it for planing a piece pushed against it, push it back down when done. This is one of the fast and simple work-holding features of this bench. And now a brief word on safety from the Society for the Preservation of Toes: remember that large wooden constructs are dangerously heavy! This lovely color on the knuckles of my toes the result of laying the bench on its back to work on the bottom side of the mortise. I tipped it back toward me, then couldn't control the load. It slipped out of my grip and the back edge landed across my toes. 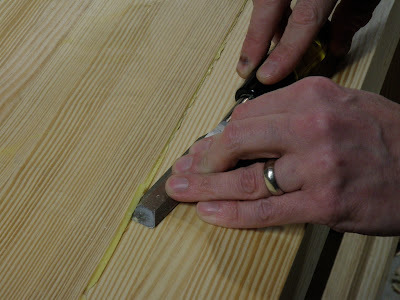 Fortunately I had laid a board on the floor to provide a space to fit my fingers when righting the bench. That caught the brunt of the impact, preventing a serious crush injury. My wife asked me later if I made up any new words. I said no, I just used the ones I already knew. Once the pain had subsided enough to continue working, I finished the bottom side. I started seeing spots as I hoisted it back upright. Won't be doing that any more! The planing stop in place. Getting a consistent friction-fit on a 12" length is time-consuming. Start fat and plane it lightly in sections, testing the fit repeatedly. As a final step, I lightly chamfered all the edges of the top with a block plane. Next I'll make the leg vise. Gret tutorial on your work bench progress. That's a nice looking bench! It's amazing how heavy they get as you add more to them. I made mine out of Doug fir and the top alone weighed about 150 pounds. By the time it was all together it was almost 300 pounds. I have really been enjoying your writing. I'm late to the party, but I am enjoying your series. I am building a bench for Longrifle building, and I like this design! Never too late to build a bench! 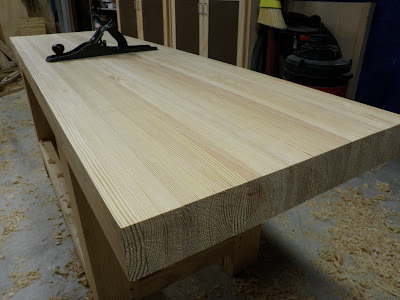 John, you mentioned that you build your bench out of douglas fir. Did you just pick through the piles at your local lumber store? Douglas fir isn't the easiest wood to plane considering the number of knots and possible Pitch pockets which are hard on jointer blades and planer knives. I milled a some douglas fir the other day and ran into a lot of tear out around some of the knots. I tried my best to avoid the knots when cutting up the lumber to final dimension. Ok for a sawbench but I don't think I'd go with that species to build a workbench. I want something that's easy to plane. I purchased my lumber at the Home Depot.. probably not a good idea hey. I even picked through the pile myself searching for the best pieces. Southern pine isn't available where I live. I was considering using Ash but I figure that would be too pricey. Not sure if Poplar would be a good choice. I need something dense and relatively inexpensive. What other wood species would make a solid bench? Maple is out of the question. way too expensive. My bench will only measure 5' X 19" that's all I have space for. Just hope that's enough mass to keep the bench from moving when planing across the grain, chopping and mortising. 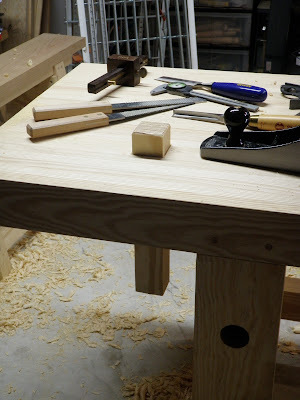 I used poplar on my smaller portable bench and my bench-on-bench, and so far it's been a great workbench wood. I got some 2" stock, pretty dense, planes up beautifully. The usual mix of sickly green and whitish, moderate price. The 5'x19" should still be fine if you use the full timber size in Schwarz's book. That's just a lot of wood, so there's plenty of mass. If you still need more mass, you can rest sandbags on the side stretchers.